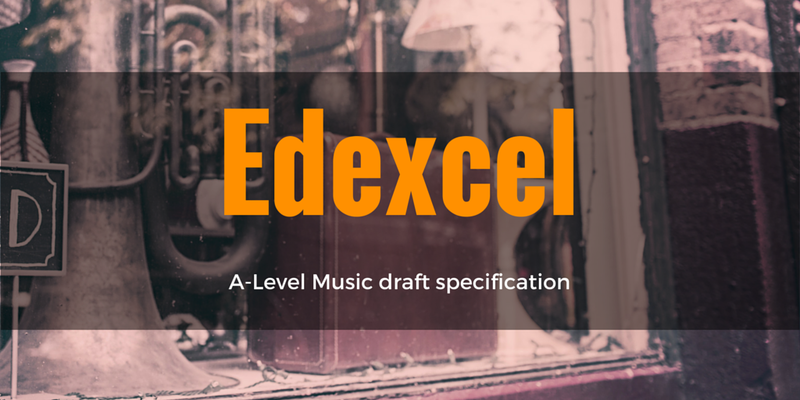 I’ve been going through each of the draft specifications for GCSE and A-Level Music to give my first impression of each and today is the turn of the Edexcel A-Level specification, which you can download from the board’s website here. The last area of study being more specifically ‘new directions in western classical music’ rather than in any wider sense of the word (or an area of study devoted to Glee). Edexcel has stuck with its usual approach of having set works and there are three for each area of study. This is certainly a wide ranging collection of pieces and will give candidates a strong starting point for future study. Candidates are required to submit a performance of at least eight minutes and a suggested maximum of twelve minutes. It’s nice that the board makes explicit mention of music technology and DJing as being acceptable forms of performance here and the specification makes it quite clear how these options should fit into the concept of a recital. Edexcel gives candidates slightly less time to complete performances than OCR. The recital must be recorded after 1st March in the year of certification and the traditional deadline of 15th May remains (compared to OCR’s 31st May). Students submitting performances below this timing will receive no marks. As I mentioned when discussing the OCR specification, it will be important for Edexcel to make this message very clear throughout the year and to ensure that the message actually reaches the teachers delivering the qualification. The composition component requires two compositions and includes some of the more innovative aspects of this specification. The briefs for this composition will be released on 1st April in the year of certification. The inclusion of the remixing brief and the fact that the stimulus is given as a .wav file suggests that Edexcel is going out of its way to open up the qualification to candidates who may otherwise have been attracted to take their Music Technology A-Level, perhaps a sign of the uncertainty of the latter qualification’s future at the time this specification was written. The other composition needs to be at least four minutes long and carries forty marks, this can be a free composition or the candidate can choose to write it in response to a brief (which, surely one could do if a piece were a genuinely ‘free composition’ anyway but it’s always nice to have clarification). This set of briefs will be released on 1st September in the year of certification, meaning that both compositions need to be completed in one year, which may cause some centres a little concern. The exam is supported by a good selection of suggested wider listening in Appendix 4, which I’m sure will soon be converted into handy Spotify playlists by teachers throughout the country. Similarly, there’s a useful musical dictionary and definition of ‘command words’ for exam questions, which should help to clarify exactly what the board expects from students during the exam.